Re: How to apply for VRO online? the following url can be used to apply online.. Candidates can apply online for both posts; application form has been published at its website. Registration has been start from 7th Dec and closed on 29th Dec, 2011. VRO application form is not available offline . 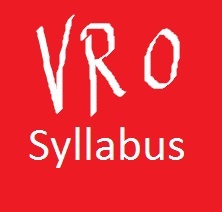 so to apply the application form for VRO,you should fill the application form online. To fill the application form online,then click on below link. Examination fee is Rupees 200/- only.For SC/ST candidates only pay Rs.50/- only. You should remitted the fee at any of e-seva/Mee Seva/AP Online centers and acknowledgments obtained. You should pay Rs.20/- for the application fee processing.You should apply any one of the following is e-seva/mee-seva/Ap Online only. Last Date for payment of fee is 27/12/2011. Visit http://www.aponline.gov.in/frptool/D...eeDetails.aspx in for list of ApOnline in Ap. and Upload in the appropriate space provided (JPG Format) in Application form. application in pdf format through the link provided on the displayed page. Interested candidates should have passed 10+2 class from a recognized board. Your age should be at least 18 years and below 34 years only then you are eligible for the exam. Relaxation in upper age limit is given to reserved caste students . 5 years in upper age limit is relaxed for SC/ST students . Last date pay the fees is:: 27th Dec 2011. Last date to fill the application form online is ::30th Dec 2011. Step 1::Once you pay the fee through E-Seva/Mee-Seva/Online center you will get the acknowledgement card and journal number will be mentioned in it .Note down this journal number .The application form is of rs 200 for general students and 100 rs for the SC/ST. Logical Skills contains 10 Questions of 10 marks. 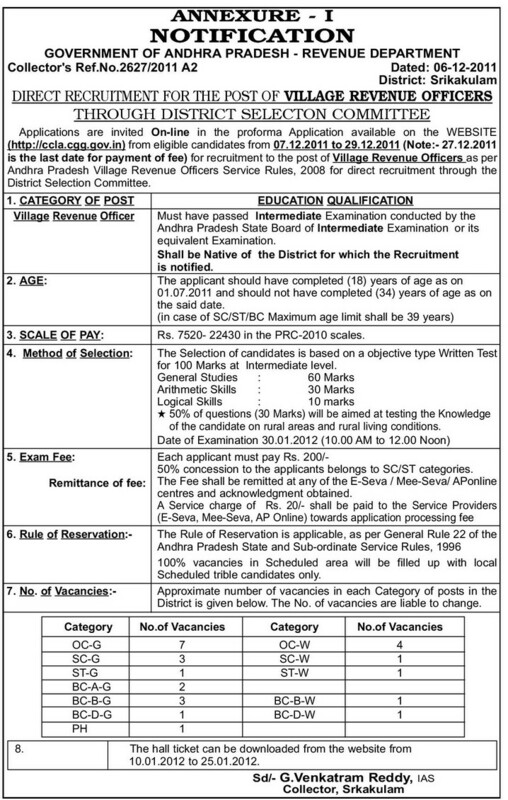 HI...it is mentioned that SC/ST candidates should pay Rs.50/- only towards examination fee and Rs. 20/- towards processing fee. Is this fee per post? meaning....if an SC/ST candidate applys for both VRO and VRA posts, he should pay 50 50=Rs. 100 Rs. 20 (processing fee) total Rs. 120? first go on this link.and fill full details and upload. if you have any doubt then you should watch AP VRO VRA Recruitment Application Submission Video on this below link.